Former Egyptian ambassador to Iraq and Afghanistan Ahmed al-Ghamrawy said major powers use ISIS to consolidate their presence in the region, just as they made Al-Qaeda to face communism. He also said that the Muslim Brotherhood in Egypt has been in connection with global Zionism for long. Through the United States, he said, they offered to secure peace with Israel. And when they were asked to prove it, they made Hamas sign an agreement not to launch a single rocket into Israel. A: It is an old story and a new version of Al-Qaeda that summarizes the plans of the major powers for the region. It started in Afghanistan, where Al-Qaeda was made by the United States to resist the Soviet Union within a larger scheme that aimed to use Muslims to hit global communism as a whole. The plan of former State Secretary Henry Kissinger was not to implicate the United States in confrontations on the ground, an idea that has Zionist dimensions. For the Talmud advises to let enemies fight each other so that God’s chosen people take the land. The West failed several times in fighting communism. And Napoleon himself failed to face Russia. So it became imperative to fight ideology with ideology. And so the American research centers and media that are controlled by Jews started to combat communism with Islam by calling for the liberation of Afghanistan with Islamic jihad. When the headquarters of the Arab League were moved from Cairo, the U.S. secretary of state told President Sadat not to worry because Cairo will become the haven of the Islamic peoples. He asked him to declare the holy jihad and request Saudi King Khaled to fund it. History repeats itself, for this is what is happening now. Al-Qaeda was the crucible that recruited Muslims for the benefit of the West. And by the end of the war in Afghanistan, Al-Qaeda had branches in many Arab countries, including Iraq, which the United States was supposed to leave in 2011 but did not until it took all the oil. Now the United States is consolidating its presence in the region. Q: If ISIS is an American product, why is the United States leading a coalition to eliminate it? A: Like it eliminated Al-Qaeda when its role was over. But the role of ISIS serving the Zionist-American interests is not over yet. That coalition is but a tactic to reposition U.S. forces in the region and resolve the conflict in Syria. If we look at the consequences of the US-led war in Afghanistan we will understand the role of ISIS. America has triumphed over the Soviets and has become the only superpower in the world. This left behind one million dead Afghanis and six million refugees, creating social and economic problems in that region. And the Soviet Union was forced to apply the Human Rights Declaration and allow more than a million Jews to immigrate to Israel. Led by Israeli Foreign Minister Lieberman, they are now planning to take apart the Arab world.The hand that hits is American and the brain that plans is Jewish. Q: So World Zionism is driving ISIS? A: World Zionism is the mastermind of all wars and crises in the region. Muslims have been fooled because it was they who fought the war for America, including the Egyptians and the Saudis who were killed in Afghanistan. They were all fooled by the idea of Islamic jihad, which is really supposed to liberate Jerusalem and not Kabul. Meanwhile, American was preparing for an eternal presence in Iraq even after withdrawing its forces in 2011. So she turned a blind eye to the growing influence of the new ISIS terrorist group. Nebuchadnezzar was the Iraqi commander in the Babylonian era who enslaved Jews, which makes it seem like a Jewish revenge at the hands of the Americans. Q: What is the relationship between ISIS and the international organization of the Muslim Brotherhood? A: ISIS is part of Al-Qaeda and the Muslim Brotherhood started political Islam. They were the agents of England before they turned to be the agents of America. And their most important goal was to rule. The Muslim Brotherhood in Egypt has been in connection with global Zionism for long. Through the United States, he said, they offered to secure peace with Israel. And when they were asked to prove it, they made Hamas sign an agreement not to launch a single rocket into Israel. Q: Where does ISIS get funds and logistical support from? A: ISIS came up with new methods. When ISIS had only 10,000 members, they entered Mosul, killed all the residents and took their money. And whenever they entered any Iraqi city after that, people fled, leaving behind all their money and possessions. In Mosul, they stormed the central bank and took half a billion dollars. And they imposed fees on businessmen to keep them alive and on gas stations selling petrol. They also sold the oil through Turkey for half its price. They have more than a billion dollars. Q: How do they get sophisticated and heavy weapons? A: Arms dealers sell weapons to whoever pays more. Also, they seized all the weapons and artillery that the Iraqi army left in Mosul. Other funds come from certain countries that have interests, such as Turkey. Q: Is Israel arming ISIS? A: Israel plays a different role. She is the engine that moves the Jewish multinational companies that control the U.S. decision making process. Mind you, it was a Jewish man called Armand Hammer who ended the war in Afghanistan. He was the owner of the Occidental Petroleum Company. He mediated the withdrawal of the Soviet Union from Afghanistan in accordance with the Geneva Convention. And so it was World Zionism that waged the war in Afghanistan and ended it. It also has a hidden role in igniting the war in Iraq. But America cannot get out of Afghanistan or Iraq. Q: Cannot or does not want to? A: Cannot because her interests force her to stay in some form or another, otherwise Russia will move in. Q: So ISIS is a marionette played by America? A: In fact it is more than that. It is the Islamic glove worn by World Zionism. It was not surprising that deposed President Mohamed Morsy addressed the Israeli prime minister in a letter with “My Faithful Friend.” For Morsy was faithful himself and met his promises to Israel, who was pressuring Egypt to give part of Sinai to the Palestinians for her to take the whole Gaza Strip. This plan was discussed in the U.S. Congress, as Obama announced that he paid Morsy $4 billion and not $8 billion in return for land in Sinai and for other things as well that I cannot disclose. And when the Republicans criticized him for failing, he said he was just a politician and cannot guarantee results. Q: How many militants are in ISIS? A: They started with 6000 in Iraq and 7000 in Syria. Now they are estimated at more than 50,000 in Syria and 30,000 in Iraq. I expect that number will double in a short period, given the funds and the brain washing. Q: What about their training and their logistical and technical support? A: Emirates News said that there are gangs in Egypt recruiting poor people to fight for ISIS for 10,000 dollars. They would go through Turkey, where they would be trained. And their families would receive a lot of money if they die. 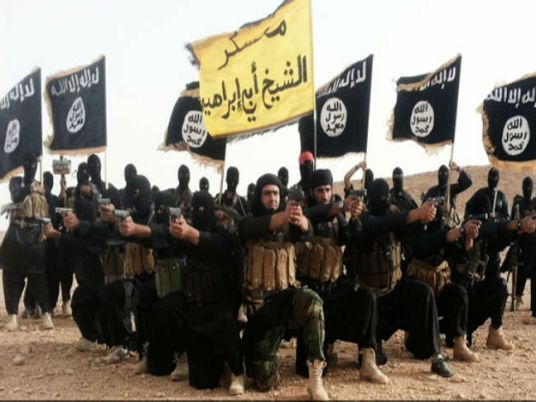 France said ISIS has 20,000 Frenchmen, Belgians or Frenchmen from Moroccan origin, of whom four have leading positions. Add to this militants from Chechnya and Afghanistan. Q: Does the United States really want to fight ISIS or is the coalition a mere distribution of regional roles? A: America is using ISIS to consolidate her presence in the region. She said the war will take three years. Had there been no ISIS, America would have created some other Islamic terrorist group. Q: Is an international coalition fighting ISIS without Syria any effective? A: Any coalition without Syria is useless. I believe the coalition is but a means to occupy Syria, which Russia knows and rejects. ISIS will vanish like Al-Qaeda and the Syrian army will be liquidated like the Iraqi army. Q: What should Egypt do? A: Egypt should not get into adventures in the region. It should remain the balanced mind of the Arab world. It should maintain its relationship with the Arabs and try to unite Arabs and Muslims. It should regain its regional role. Egypt is now sovereign for the first time. Mubarak was all the way obedient to America. America was shocked when Sisi requested the Egyptian people to fund the Suez Canal project because she wanted to do that through the World Bank. Q: If ISIS reaches the borders of Saudi Arabia, would Egypt sent troops to defend it? A: Yes. Egypt defended Saudi Arabia and Kuwait before. Q: But this would be an adventure. A: It would be an exception. Q: Why do Saudi Arabia and Egypt request that Syria be part of the coalition? Q: Which is more dangerous to Saudi Arabia Iran or ISIS? A: Saudi Arabia should answer that question. In my opinion, there is a plot to create a conflict between Sunnis and Shiites in the region. That is why they use Iran to scare Saudi Arabia. Senior American left-wing politicians always said Iran is the greatest ally of America because it threatens the Gulf states and so they will keep taking arms from America. And Israel supports such conflict because if the Sunnis and the Shiites unite, the Jews will be at the jaws of a plier. Q: After Qatar abandoned the Brotherhood, what will become of them? A: Qatar did not abandon the Brotherhood. She deported only seven of them and still hosts 700 others. America asked her to do so for Saudi Arabia to finance the war on ISIS. Q: What does the West want through ISIS? A: The West wants to tarnish the image of Islam that began invading Europe. They don’t want more Europeans to convert to Islam, and ISIS are helping them with its brutality.